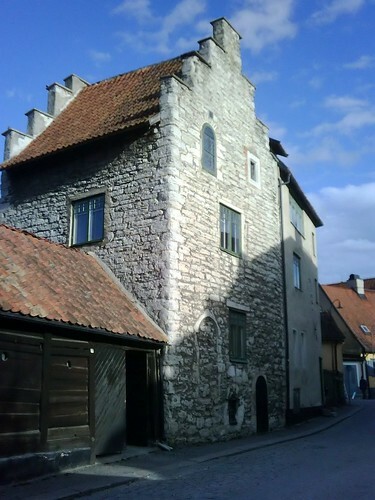 It began with a trip to Visby, the largest town on the island of Gotland, off the Swedish coast in the Baltic. 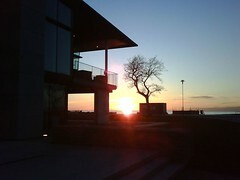 I'm now on the faculty at the University of Gotland, and I go there about five times a year. These trips have become so routine that I've stopped recording them in my News pages. This one wasn't routine. I got trapped on the island by the Icelandic Eyjafjallajokull volcano ash cloud that shut down European air travel, and it took me seven extra days to get home again. In the course of the trip I passed through five capital cities in five days. On April 11 I flew from London to Stockholm and changed to a small propellor plane that flies to Gotland. Monday the 12th I had no direct teaching duties and did some work on other projects. On Tuesday I gave my Mechanics workshop to a room full of students. I need to come up with a slightly more numbers-oriented game to use in the workshop, but it went OK.
Wednesday was spent working with first-year student teams all day. I'll be a judge at the Gotland Game Awards next month, so I shouldn't show any favoritism by saying which ones I liked best... besides, everybody still has a lot of work to do. That afternoon the volcano started producing enough ash to become a hazard to airplanes. I didn't think much of it, though; Gotland is a long way from Iceland, right? Thursday I spent working with second-year teams. The weather was clear and cold, with no sign of any ash in the sky. Little did I know that British airspace was being closed entirely, and that night, Sweden's airspace closed too. I figured it would literally blow over after a while, but on Friday it became clear that I wouldn't be going home on Saturday. I called my airline and rebooked my flight for the first thing they could give me, which was the following Wednesday. The weekend was a waiting game. I worked on other things and wandered around Visby a little bit, wishing I had brought a better camera. Meanwhile, all of Europe was in an uproar -- trains and ferries were jammed, as travelers tried to get home. I was on an island, Gotland, trying to get to another island, Britain, which made it doubly difficult for me. On Sunday my wife managed by a miracle to reserve me a ticket on the Eurostar (the Channel Tunnel train) from Brussels to London on Saturday the 24th... a week away. It didn't take long to decide that I should buy it. There was no sign of the volcano letting up, and people were predicting that it might go on for months. Lovely as Visby is, I couldn't stay there indefinitely. The trick was to find a way from Visby to Brussels. Monday morning I went in to the department office to talk to Don Geyer, director of the game program, about what we should do. The trains were so full that I wasn't sure I could count on them. Don kindly offered to put me on a ferry to the mainland and rent a car for me in Stockholm, which I would drive to Brussels. The drop-off charge would be horrendous, but it seemed like the best way. A travel agent made the arrangements, and I spent the rest of the afternoon getting driving directions from Google and printing out road maps of the journey. One of the nice things about teaching all over Europe is that I have clients in a lot of places. Before I left I sent a message to everyone who was along my route, offering them a special VOLCANO DISCOUNT good for ONE WEEK ONLY. I knew it was a long shot on such short notice, but two people actually took me up on it, as you'll see. 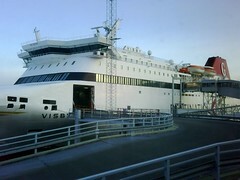 The ferry left at 7 AM on Tuesday morning. In order to pack, have a shower, and walk to the ferry port in time, I had to get up at 4. So began the odyssey. This map shows my actual trip from the Visby Ferry Terminal to the Brussels Airport. I turned in the car there and made the rest of the journey by train, which Google Maps can't show. 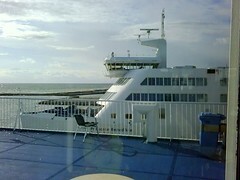 The ferry was large and fancy, much nicer than some of the ones I've taken across the English Channel. At that hour of the day, there was almost nobody on it. They got me a first-class ticket, which meant that I had a big assigned seat in the forward part of the ship, with an airplane-style sound system and a movie. Alas, I was too sleepy to enjoy it. I slept most of the 3-hour ride to Nynäshamn, which is where the ferry makes landfall on the Swedish mainland. The ferry connects with a bus to the Stockholm Central Bus Station, and the Hertz Rent-a-Car offices were just outside. I got there at just about noon. My car proved to be a Ford Converse station wagon (estate car). It was pretty big, but it was comfortable and had lots of power. It didn't take me long to get out of Stockholm. From then on it was high speed freeway all the way to Jonköping. Swedish freeways are smooth and not too crowded -- in a nation of only 9 million people, that's not a surprise. Unfortunately, the airwaves were equally uncrowded... out in the country, there was very little on the radio. My friend Ulf Wilhelmsson at the University of Skövde was one of the ones who responded to my Volcano Discount offer. He couldn't hire me, but he did offer to put me up for the night. 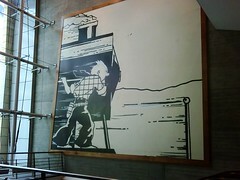 It was great to see him again, and well worth the brief detour to his house in Tidaholm. I got there just in time for dinner. Thanks, Ulf! This was the longest and certainly the dullest day. Ulf and his wife had to get up early, but I took it a bit easy -- since the previous day began at 4 AM, I needed the sleep. Back down to the E4 at Jonköping and on down to Malmö. The landscape didn't change much: rolling hills, lakes, and trees, trees, trees. It flattened out a bit as I got to Helsingborg and started following the coast. There's a ferry from Helsingborg across to Helsingør in Denmark (the home of Hamlet's castle, Elsinore, which Mary Ellen and I visited many years ago), but I decided to take the toll bridge from Malmö to Copenhagen. That's quite some toll. The Golden Gate Bridge in San Francisco is up to $6, I believe; this was 395 Swedish crowns, which is $54 or £35. There weren't any customs formalities at the border with Denmark -- indeed, none at all until I went to board the Eurostar for Britain. Sweden, Denmark, Germany, Holland, and Belgium, plus many other European countries, are part of the Schengen Agreement, a treaty that allows free movement across most intra-European borders -- an idea that would horrify most Americans, I'm sure. Britain, being an island and the target of a certain amount of terrorism, is not in the Schengen Agreement. However, Britain has free movement (they call it a "common travel area") with the Republic of Ireland. In fact, there aren't even any signs to indicate when you're entering the Republic from the North. They would probably get torn down. I skirted the edge of my second capital city, Copenhagen, and drove on down to Rødby, where you catch the ferry to Germany. There was quite a lot of traffic heading south out of the city, but the farther I went the more it thinned out. The British are forever moaning about how wind turbines spoil the landscape (I don't agree); they should see southern Sweden and Denmark. I don't know how much Scandinavian electricity actually comes from these turbines, but it's not for want of trying -- they were all turning steadily, and I must have passed close to a hundred of them. The ferry to Germany only took 45 minutes, but was even more expensive than the bridge from Sweden: 499 Danish crowns, which is $89 (£58). I grabbed a quick dinner aboard, but it seemed like I had hardly wolfed it down before we were pulling into Puttgarden and I had to get back in my car. If there's one thing every red-blooded male in the Western world knows about German roads, it's that there's no speed limit on the autobahn. That's true in some places, but not everywhere. On most of my route the speed limits were as low as anywhere else -- 110 or 120 kph -- and there were road works every 10 kilometers or so. I did try pushing the car a bit in an unlimited section, but a Ford Converse is not a Mercedes S-class and I backed off after a few seconds. It got a little twitchy at high speeds. On I went, across northern Germany, past Hamburg towards Bremen. At this point I diverted from my direct route to Brussels, because I was going to stop off in Leeuwarden in the Netherlands. Outside Bremen I found a roadside hotel that was comfortable and surprisingly inexpensive. The next client along my way was the Northern College of Leeuwarden, for whom I've done a lot of work in the last couple of years. As it happened, Thursday was the birthday, and also the graduation date, of my friend Jonathan van Woudenberg, who has worked with me a lot there. It only took me a couple of hours to drive to Leeuwarden. I checked into a hotel and then went to the university to see his graduation presentation and have a celebratory dinner with his friends. I spent all day Friday working with students in the Communication and Multimedia Design department, which I've done several times before. At the end of the day I was off again, to a hotel Mary Ellen found for me near the Amsterdam airport (at one point we thought I might fly home from Amsterdam). This took me along the magnificent Afsluitdijk, which means "Enclosure Dike" in English. 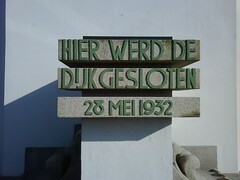 I stopped to take a few pictures at the Art Deco monument that commemorates its completion. 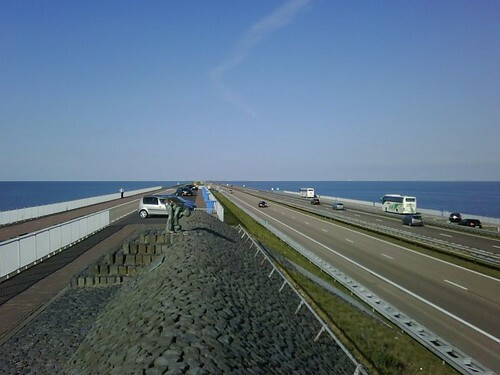 The Afsluitdijk, looking north: a nice illustration of the concept of the vanishing point. On the left is the Waddenzee (an intertidal zone of the North Sea); on the right is the Ijsselmeer.The figure in the middle distance is a sculpture. This brings up a story. A little learning is a dangerous thing, as I found out on one of my first visits to the the Netherlands as an adult. When I knew I was going to Holland I looked on a map and was surprised to find that there was no sign of the Zuider Zee anywhere. Once I got there I asked several people, all of them young, where it was. None of them had any idea what I was talking about. (This was not helped by my mispronunciation of the name.) I explained about the record and the book. They had never heard of either. Some later research revealed the explanation. Hans Brinker was written in the 19th century by an American woman who had never been to the Netherlands -- it was very popular in the US, but is unknown in Holland. The Zuider Zee does not exist and has not existed since May 28, 1932. It was there when she wrote the book, but it's gone now. It used to be an enormous inlet of the North Sea, but on that day, the Zuider Zee was completely enclosed by the Afsluitdijk, and was renamed the Ijsselmeer. With time, fresh water from the river IJssel pushed out the salt water, and now it's a vast lake. In addition, the Dutch reclaimed quite a lot of it and created a completely new province, Flevoland, which is actually below sea level. From there I went on to my hotel near the airport, an easy drive. The last day of the journey was a long one, but not particularly arduous. I got up and drove from the Amsterdam airport to the Brussels airport, a matter of about three hours. Here I encountered the heaviest traffic along the route, but it was never really bad. I had to get the car to the Hertz facility by 1:30, and I made it with about half an hour to spare. From the airport -- which was now open and busy -- I took a train to Brussels-Midi, the station that the Eurostar departs from. Unfortunately, my train wasn't until 8 PM and the automated left-luggage lockers weren't working, so I couldn't go anywhere. There was nothing to do but hang around with my suitcase. Fortunately I keep a lot of free E-books on my PDA (mostly old ones thanks to the wonderful Project Gutenberg), so I didn't get bored. To my surprise, the Eurostar wasn't jammed -- it wasn't even full. It's fast, though. Brussels to London is only two hours. With the time change to the UK, I got in to St. Pancras station at 9 PM, took a taxi across London to Waterloo station (I hate hauling luggage through the Underground), and was home by 10:30. Parts of the trip were fun; parts were tedious; parts were interesting and unusual. It was certainly expensive, and would have been a great deal more so if the University of Gotland hadn't kindly paid for the car and the ferry from Gotland to the mainland. I owe a lot to Mary Ellen Foley, my tireless Ground Support Team, who researched cars and trains and ferries and hotels, and got me the Eurostar ticket and the Amsterdam hotel. Unfortunately, it also cost me a week's work on my PhD thesis, which I can ill afford. I have to go back in a month for the Gotland Game Awards, and I'm really hoping it doesn't happen again.